In our article on Newcastle United’s Asics kits, we looked at how The Toon used to have different sponsors’ logos on their home and away shirts. Another side which operated a similar policy was Nottingham Forest in the Premier League’s inaugural season, 1992-93, and in one of their games early in that ill-fated relegated season, they came up against another team with a beer-maker on their chests, but not the one you’d expect. From 1987 onwards, Forest carried the name of local brew Shipstones, and when the club launched its classy new kit in the summer of 1992, ‘Shippos’ was again on the front, with a new logo. However, the club’s white away kit, which had featured Shipstones in 1991-92, now had the name of Shipstones’ Canadian parent company, Labatt’s. And, while all replicas of the home had Shipstones, when Forest were away from home – or on live television – Labatt’s was on the red shirt as it was sold to a wider audience. Blackburn were, generally, more straightforward. Sponsored by Scottish and Newcastle, the same as Newcastle United, Rovers had McEwan’s Lager on their shirts. A one-off change came when Forest came to Ewood Park on September 5, 1992, however. With Scottish and Newcastle having acquired the rights to brew and sell Coors under licence in the UK, the Rovers shirt carried the Coors Extra Gold logo, housed in a massive white panel (the following season, McEwan’s would also have a white background for greater legibility). While Forest had no qualms about changing to red shorts in the event of a clash – and sometimes even if there wasn’t – there was a delay with the arrival of the new sets. 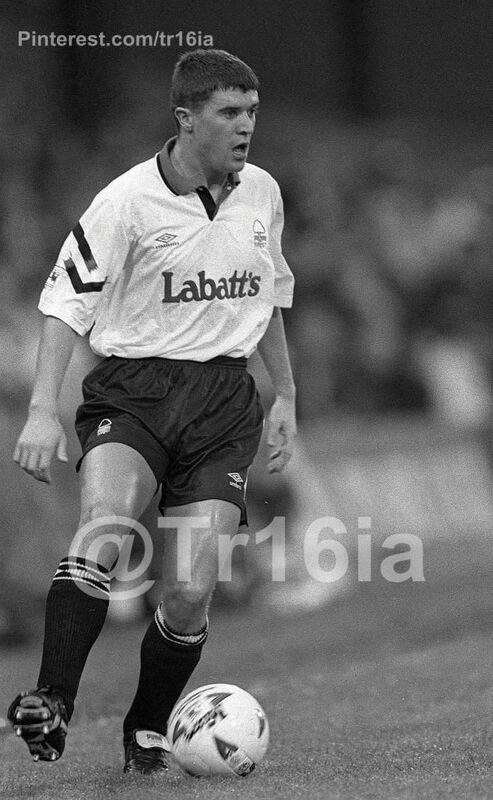 In the pre-season Makita Tournament, Forest had worn the red alternative shorts from the previous 1990-92 kit, but as the new Premier League had removed the stipulation that the away team had to change shorts when a clash happened, they were able to wear their full ‘away home kit’, with the Labatt’s wording. Weekly magazine Shoot! was styling itself as ‘The Voice of The Fans’ at the time, and displayed its irritation in the September 19 issue (thanks to Lee Hermitage for sourcing a copy). Forest retained the dual sponsorship for the promotion season of 1993-94 but from 1994 until 1997, when Pinnacle Insurance took over, Labatt’s had shirt-front exclusivity. Another insurance firm, CIS, replaced McEwan’s as Blackburn sponsors in 1996. Meanwhile, after that initial British exposure, Coors came to wider football sponsorship prominence from 1994-97, when they partnered with Chelsea.